Last week we dodged thunder clouds and rain drops to capture Jodie + Phil's engagement shoot series. We made record timing visiting our planned backdrops in hopes of wrapping the shoot before the storms wrapped the city. We started our shoot with a toast at one of Chicago's most bustling downtown watering holes, The Gage. Then we headed east for a great little spot on Lake Michigan at the harbor where Phil likes to launch his boat to get to his late night fishing spots. A few more softly lit stops later and we found our way to the bright lights that makeup the Chicago Theater marque, an iconic shot requested by Jodie. I love to plan my routes of travel for engagement shoots and wedding day photography around places and spaces that are important to the people in the imagery I plan to create. I find my subjects feel most comfortable and at ease in places they love to visit and consider their meaningful spots in a city full of lights, colors and patterns. I'm so thrilled to be a part of documenting Jodie + Phil's love. Though I'm joining the tour surely after they've began, I can't wait for more occasions to capture their genuine smiles, excitement and love. October is just around the corner and soon enough they'll be married. 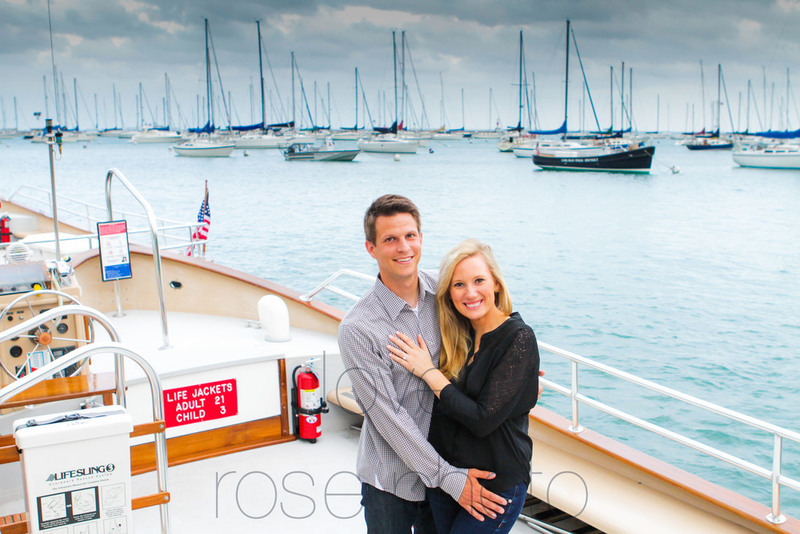 Jodie + Phil, thank you so much for trusting me to tell your story with the Rose Photo lens. Your comfortable style and sense of humor made our session that much more enjoyable. I'll see you both in just four months when you say " I do"!